In the heat of the summer, it’s tempting to run the air conditioning full blast 24/7. However, that’s not exactly environmentally friendly – or easy on your wallet. So what to do? How can you find that happy medium: an A/C temperature that will keep your home comfortably cool without turning you into an energy hog? Energy Star recommends running your air conditioner at no lower than 78 degrees Fahrenheit (25.5 Celsius) to maximum your home’s energy efficiency (which, in dollars and cents, translates to lowered electricity costs). This is very close to the national average high temperature for the month of May – in other words, a pleasant spring day. Painting your home a pale color that reflects the sun’s rays and shading sunny windows with shutters, blinds, or heavy drapes will play a part in reducing interior temperatures. Proper insulation benefits you in summer and winter alike, by limiting the amount of outside air that gets into the house. You can also help out your cooling system by using other appliances wisely. Run the dryer in off-peak hours (or take advantage of the sun’s free energy and hang your clothes to dry!). Similarly, use your stove early in the morning – for example, to bake chicken or vegetables to be served cold at suppertime. Or enjoy some energy-conserving summer fun by hosting an outdoor barbecue! Especially if you are living in, say, Georgia, or another southern state, chances are you will be tempted to turn the temperature down to the lowest your Atlanta HVAC will go. However, there are more eco-friendly ways to stay cool. Live with the season by dressing appropriately – in loose clothing made of natural fabrics like cotton or linen. Even if you have to wear a suit for work, changing into casual summer outfits as soon as you get home will make you more physically comfortable and also send a subliminal message that it’s time to relax. Take care of your air conditioner and it will take care of you. Schedule regular HVAC service checkups to make sure it is running optimally. Clean the blower component and the evaporator and condenser coils every year, and the filter once a month when the air conditioning is in heavy use. Make sure that the system is using refrigerant fluid at a normal rate. 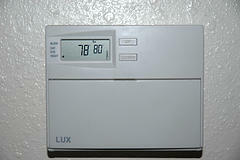 If your system is more than 10 years old, it may be time to replace it with a more energy-efficient model. Shop for one with the Energy Star.